Dharmaraksita (Pali: Dhammarakkhita) was one of the missionaries sent by the Mauryan emperor Ashoka to proselytize the Buddhist faith. He is described as being a Greek (Pali: «Yona», lit. «Ionian») in the Mahavamsa, and his activities are indicative of the strength of the Hellenistic Greek involvement during the formative centuries of Buddhism. Greek communities had been present in neighbouring Bactria and in nortwestern India since the time of the conquests of Alexander the Great around 323 BCE, and developed into the Greco-Bactrian and Indo-Greek kingdoms until the end of the 1st century BCE. Greeks were generally described in ancient times throughout the Classical world as «Yona», «Yonaka», «Yojanas» or «Yavanas», lit. “Ionians». It seems they were ardent recipients of the Buddhist faith and the example of Dharmaraksita indicates that they even took an active role in spreading Buddhism as leading missionaries. Dharmaraksita is then described in important Buddhist Pali historial texts, the Dipavamsa and the Mahavamsa, as being a Greek Buddhist missionary, in charge of propagating the faith to the northwestern part of the Indian subcontinent. The thera, MaMdeva he sent to Mahisamandala. but the thera Maharakkhita he sent into the country of the Yona. and to Suvambhurni he sent the two theras Sona and Uttara. The country of Aparantaka has been identified as the northwestern part of the Indian subcontinent, and comprises Northern Gujarat, Kathiawar, Kachch, and Sindh, the area where Greek communities were probably concentrated. To this day, a city in Gujarat is named Junagadh, originally «Yonagadh», lit. «City of the Greeks». In another Pali reference, a Buddhist monk from Sri Lanka named Punabbasukutumbikaputta Tissa Thera is said to have been to India in order to study with «the Yonaka Dhammarakkhita», whereupon he attained the «patisambhida» (analytical knowledge). (VibhA.389, Sammoha-Vinodaní, Vibhanga Commentary). The Milinda Panha is another famous non-canonical Pali Buddhist text that describes the religious dialogues between the famous Indo-Greek king Menander, whose kingdom was in Sagala in today’s Punjab, and a Buddhist monk called Nagasena, around 160 BCE. It is today one of the texts of reference of Theravada Buddhism. 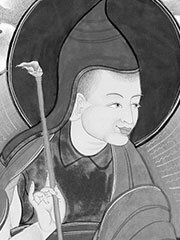 According to the Milinda Panha (I 32-35), the monk Nagasena, before his encounter with Menander, was once a student of Dharmaraksita and learnt Buddhism and reached enlightenment as an arhat under his guidance in Pataliputra. «Nâgasena went on to the Asoka Park to Dhammarakkhita. And after saluting him, and telling him on what errand he had come, he learnt by heart, from the mouth of the venerable Dhammarakkhita, the whole of the three baskets of the Buddha’s word in three months, and after a single recital, so far as the letter (that is, knowing the words by heart) was concerned. And in three months more he mastered the spirit (that is, the deeper meaning of the sense of the words). This event took place roughly a hundred years after the missionary efforts of Ashoka, and it would suggest that Dharmaraksita was a young man under Ashoka, became a respected elder settled in the Ashokan capital of Pataliputra, and then trained a young Nagasena in the Tripitaka and towards enlightenment, before Nagasena himself met Menander at a venerable age . The Milinda Panha therefore seems to relate the dialogue between a great Greek king, Menander, with a monk trained in Buddhism by the great Greek Buddhist elder Dharmaraksita, tending to suggest the importance of Greeks during the first formative centuries of Buddhism.